Constitution of the North Brisbane Lapidary Club Inc.
Rules stand and mean the whole of this document, also referred to as Constitution. A word or expression that is not defined in these rules, but is defined in the Act has, if the context permits, the meaning given by the Act. For the purpose of this constitution member includes a person attending as a proxy unless stated otherwise. 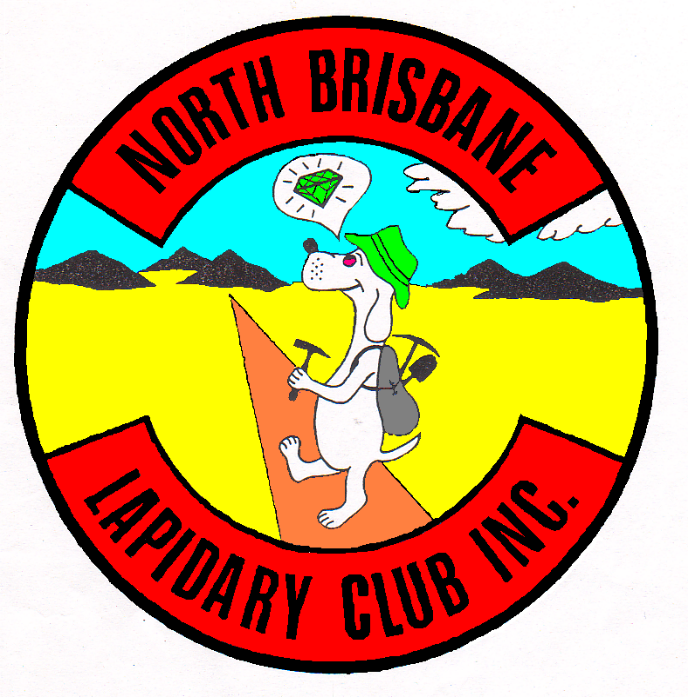 The name of the organisation shall be the North Brisbane Lapidary Club Inc. Hereinafter called the Club or Association. Do all such acts, matters and things as are incidental to, or conducive to the attainment of the above objects or any one of them. Their objects are altogether or in part similar to those of the Association. They prohibit the distribution of its income and property among members to the extent at least as great as that imposed under or by virtue of rule (37(7). Buy, sell and deal in all kinds of articles, commodities and provisions, both liquid and solid, for the members of the Association or persons frequenting the Associations premises. In case the Association shall take or hold any property which may be subject to any trusts the Association shall only deal with the same in such manner as is allowed by law having regard to such trust. To carry out, exercise and comply with any such arrangements, rights, privileges and concessions. Appoint, employ, remove or suspend such managers, clerks, secretaries, servants, workmen and other persons as may be necessary or convenient for the purpose of the Association. (ii) Contribute to, subside or otherwise assist and take part in the construction, improvement, maintenance, development, and working, Management, carrying out, alteration or control thereof. Borrow or raise money either along or jointly with any other person or legal entity in such manner as may be thought proper and whether upon fluctuating advance account or overdraft or otherwise to represent or secure any moneys and further advances borrowed or to be borrowed alone or with others as aforesaid. Sell, improve, manage, develop, exchange, lease, dispose of, turn to account or otherwise deal with all or any part of the property and rights of the Association. Take or hold mortgages, liens or charges, to secure payment of the purchase price, or any unpaid balance of the purchase price, of any part of the Association’s property of whatsoever kind sold by the Association, or any money due to the Association from purchasers and others. Take such steps by personal or written appeals, public meetings or otherwise, as may from time to time be deemed expedient for the purpose of procuring contributions to the funds of the Association, in the shape of donations, annual subscriptions or otherwise. Print and publish any newspaper, periodicals, books or leaflet that support or promote the objects of the Association. Which shall prohibit the distribution of its or their income and property among its or their members to an extent at least as great as that imposed upon the Association under or by virtue of sub-rule (37)(7). Transfer all or any part of the property, assets, liabilities and engagements to any or more of the incorporated Associations with which the Associations is authorised to amalgamate. Purchase or otherwise acquire and undertake all or any part of the property, assets, liabilities and engagements of any or more of the incorporated Associations with which the Association is authorised to amalgamate. Make donations for patriotic, charitable or community purposes. Do all such other things as are incidental or conducive to the attainment of the objects and the exercise of the powers of the Association. Herein the term “Member” shall include both ordinary and associate members. An ordinary member is one who uses the workshop facilities of the Association and / or participates in fossicking excursions. Junior members are not entitled to hold an office of the Management Committee. Junior members are to be accompanied and supervised by a person 18 years or over. Temporary members are not entitled to hold any office of the Management Committee or any other position in the Association. A person applying for temporary member status is required to pay the joining fee as determined from time to time by the Management Committee. Guest members are not entitled to hold an office of the Management Committee or any other position in the Association. A person applying for guest membership is required to pay the joining fee as determined from time to time by the Management Committee. eligible to vote or hold any office at the Association. may have their membership terminated by the Management Committee. Any member who is more than 3 months in arrears with their membership fee will have their membership automatically terminated without the right to appeal. Temporary and guest members shall be determined by the Management Committee from time to time. The Management Committee may move at a Special General or Annual General Meeting that a person (either an ordinary member or associate member) who has given distinguished service to the organisation over a number of years may be made a Life Member in recognition of such services. In the form decided by the Management Committee. arrange for a meeting with at least three (3) members of the current Management Committee. Until an applicant has attended a general meeting or met with the Management Committee their status shall be deemed as pending. Failure to comply with sub-rule 7(1)(c) may cause the Management Committee to reject the membership application in which case the applicant without right to appeal this decision. The membership fee comprises of a once of joining fee and an annual payable fee. Except for temporary and guest members in which case a once of joining fee per annum is payable. The membership fees for each class of membership shall be such sum as the members shall determine on an annually basis at the October General Meeting. The Management Committee has the right to reject a membership application in a meeting following the meeting the applicant was admitted should the applicant not have complied with section 7(1)(c). Applicants for Guest or Temporary Membership will be considered by the Duty Officer after receipt of the application form and the payable fee. A member may resign from the Association at any time by giving notice in writing to the Secretary. Such resignation shall take effect at the time such notice is received by the Secretary unless a later date is specified in the notice when it can take effect on that later date. The Member concerned shall be given a full and fair opportunity of presenting his case and if the Management Committee resolves to terminate his membership it shall instruct the Secretary to advise the member in writing accordingly. Any member who has his/her annual subscription three (3) months or more in arrears will have their membership automatically terminated without right of appeal. The Secretary must upon receiving a notice of intention to appeal call a special general meeting to decide the appeal. The special general meeting must be held within three (3) months of the Secretary receiving the notice of intention to appeal. Members attending the special general meeting shall be given the opportunity to speak without fear of reprisal in support of either the appellant or the Management Committee. The appeal shall be determined by a majority vote of the members present in person and eligible to vote at the meeting. Proxy votes shall not be permitted to vote upon an appeal. Where a person, whose application is rejected, does not appeal against the decision of the Management Committee within the time prescribed by these Rules or so appeals but the appeal is unsuccessful, the Secretary shall forthwith refund the amount of any fee paid. The Management Committee must keep a register of members of the Associations. Any Member may request full disclosure about the information held by the Association about themselves. Access to the member register information will be restricted to those position holders within the Association where the information is required for the administration and functioning of the Association. The member register, and the details held within, is at all times the property of the Association. Upon ceasing to hold a responsible position within the Association, the position holder will remove, delete, render unusable or otherwise destroy any member register information previously held by the individual position holder. No member may have access to full member information about other members, unless previously approved by the Management Committee and with consent of that particular member. Sub-rule (6) does not apply if the use or disclosure of the information is approved by the Association. All of whom shall be current financial members of the Association. Shall be eligible upon nomination for re-election. No member shall hold the same office of the Management Committee for more than two consecutive years. A list of candidates’ names in alphabetical order with the proposers and seconders name shall be posted in a conspicuous place in the clubrooms for at least seven (7) days immediately preceding the Annual General Meeting. A secret ballot shall be held to determine that position. Ballot lists shall be prepared (if necessary) containing the names of the candidates in alphabetical order. Each member present at the Annual General Meeting and eligible to vote may vote for one (1) candidate for each vacant position. Any member of the Management Committee may resign from the Committee by giving written notice of the resignation to the Secretary. A later time is specified in the notice. A member of the Management Committee may be removed from office at a general meeting of the Association if a majority of members present and eligible to vote at such meeting vote in favour of removing the member from office. Before a vote is taken, the member to be removed from office shall be given the opportunity to fully present their case. A member has not right of appeal against his / her removal from office. The continuing members of the Management Committee may act notwithstanding any casual vacancy in the Management Committee. However, if the number of Committee members is less than the number necessary for the quorum, the continuing members may act only to call a general meeting of the Association. Except as otherwise provided by this Constitution and subject to resolutions of the members of the club carried at any Annual or General or Special General Meeting, the Management Committee shall have the general control and Management of the administration of the affairs, property and funds of the club. The Management Committee shall have authority to interpret the meaning of these rules and any matter relating to the club on which these rules are silent. If there is more than one (1) financial institution for the Association, the financial institution nominated by the Management Committee. At least once in every month to exercise its functions. The Management Committee may meet together and regulate its proceedings as it thinks fit. The Management Committee shall decide any questions by majority of votes. In the case of equality of votes on any question the question shall be deemed to be decided in the negative. A member of the Management Committee shall not vote in respect of any contract or proposed contract with the Association or any matter arising therein in which the member is interested. In the absence of the President and the Vice-President, the remaining members of the Management Committee may choose one of their numbers to chair the meeting. If within half an hour from the time appointed for the commencement of the Management Meeting a quorum is not present, the meeting shall lapse. The meeting shall stand adjourned to the same day in the next week at the same time and place. If a quorum is not present at the adjourned meeting it also shall lapse. If the Secretary receives a request signed by at least 33% of the members of the Management Committee, the Secretary must call a special meeting of the committee. The Secretary must give notice to the members of the committee within 14 days of receiving the request. The business to be conducted at the special meeting. The business to be conducted at such meeting. At every meeting of the Management Committee, a simple majority of the members elected or appointed to the committee form a quorum. If there is no quorum within 30 minutes after the time fixed for a Management Committee meeting, the meeting shall lapse. If at an adjourned meeting mentioned in sub-rule (2) there is no quorum within 30 minutes after the time fixed for the meeting, the meeting lapses. The Secretary must ensure full and accurate minutes of all questions, matters, resolutions and other proceedings of each Management Committee meeting are entered in a minute book. To ensure the accuracy of the minutes, the minutes of each Management Committee meeting must be signed by the chairperson of the meeting, or the chairperson of the next Management Committee meeting, verifying their accuracy. The Management Committee may delegate any of its powers to a sub-committee consisting of such members of the Association as the Management Committee sees fit. Any sub-committee so formed shall in the exercise of the powers so delegated conform to any regulations that may be imposed on it by the Management Committee. A member of a sub-committee who is not a member of the Management Committee is not entitled to vote at a Management Committee meeting. If no such Chairman is elected, or if at any meeting the Chairman is not present within ten (10) minutes after the time appointed for the holding of the meeting, ne members present may choose one of their numbers to be Chairman of the meeting. Questions arising at any meeting shall be determined by a majority of votes of the members present. In case of equality of votes the question shall be deemed to be decided in the negative. All acts performed by the Management Committee, a sub-committee or a person acting as a member of the Management Committee is taken to have been validly performed. A Management Committee member, sub-committee member or person acting as a member of the Management Committee was disqualified from being a member of the relevant committee. A resolution in writing signed by all the members of the Management Committee for the time being entitled to receive notice of a meeting of the Management Committee shall be as valid and effectual as if it had been passed at a meeting of the Management Committee duly convened and held. Any such resolution may consist of several documents in like form, each signed by one or more members of the Management Committee. The Secretary may call a general meeting of the Association. The Secretary must give no less than 14 day notice to each member of the Association. If the Secretary is unable or unwilling to call a meeting, the President must call the meeting. The Management Committee determines in which manner the notice of a general meeting shall be given. A meeting called to hear and decided a proposed special resolution of the Association. At any general meeting the quorum is consists of double the number of members on the Management Committee plus one. No business shall be transacted at any general meeting unless a quorum of members is present at the time when the meeting proceeds. If within half an hour from the time appointed for the commencement of a general meeting a quorum is not present, the general meeting shall lapse. The General Meeting shall stand adjourned to such other day, time and place as the Management Committee may determine. If at the adjourned meeting a quorum is not present within half hour from the time appointed for the meeting, the members present shall be a quorum. The Chairman may and shall if directed by the meeting and with the consent of any meeting at which a quorum is present adjourn the meeting from time to time and from place to place. No business shall be transacted at any adjourned meeting other than the business left unfinished at the meeting from which the adjournment took place. The Secretary is not required to give members notice of an adjournment or of the business to be conducted at an adjourned meeting unless a meeting is adjourned for at least thirty (30) days. When a meeting is adjourned for thirty (30) days or more, notice of the adjourned meeting shall be given as in the case of an original meeting. The President is to preside as chairperson. If the Vice-President is not present or unwilling to act, then the members present shall elect one of their numbers to be chairman of the meeting. The chairman shall maintain order and conduct the meeting in a proper and orderly manner. A member who participates in a meeting as mentioned in sub-rule (3) is taken to be present at the meeting. Every question, matter or resolution shall be decided by a majority of votes of the members present. Every member shall be entitled to one vote. No member shall be entitled to vote at any general meeting if his annual subscription is more than one month in arrears at the date of the meeting. In the case of an equality of votes the chairman shall have a second or casting vote. If 20% of members present demand a ballot, there shall be a secret ballot. If a secret ballot is to be held, the chairman shall appoint two members to conduct the secret ballot in the way the chairman decides. The chairman will declare the result of the ballot. The result of the ballot shall be deemed to be the resolution of the meeting. Being given written notice of an intention to appeal as per outlined in section 11. A special meeting must be held within three (3) months after the Secretary is directed or requested to do so as outlined in sub-rule (1). If the Secretary is unable or unwilling to call the special general meeting, the President must call the meeting. For the purpose of this rule, a special general meeting may be referred to as special meeting. An instrument appointing a proxy must be in writing. The instrument appointing a proxy shall be deemed to confer authority to demand or join in demanding a secret ballot. North Brisbane Lapidary Club Inc. I, _______ of ________ being a member of the above Association, hereby appoint ________, of ________, as my proxy to vote for me on my behalf at the (annual) general meeting of the Association, to be held on the ____ day of ____ 20__. *Strike out whichever is not desired (unless otherwise instructed, the proxy may vot as he/she thinks fit. The proxy may be a member of the Association or another person. Each instrument appointing a proxy must be given to the Secretary before the start of the meeting or adjourned meeting at which the person named in the proxy is to vote. The Secretary must keep full and accurate minutes of all questions, matters, resolutions and other proceedings of each general meeting. All minutes are to be kept in a minute book or other form determined from time to time by the Management Committee. To ensure and verify the accuracy, the minutes of each Annual General Meeting, general meeting and special general meeting must be signed by the chairperson of that meeting or the chairperson of the next general meeting. Give the member copies of the meeting if requested. The Management Committee may make, amend or repeal by-laws or standing orders, not inconsistent with the Constitution, for the internal management of the Association. Any by-laws or standing orders may be set aside by a vote of members at a general meeting of the Association. Subject to the provision of the Associations Incorporations Act, these Rules may be amended, rescinded or added to from time to time by a special resolution carried at any meeting. However, an amendment, repeal or addition is valid only if it is approved and registered by the relevant department within the Queensland State Government. Formal written notice of motion detailing the proposed amendments to the Constitution must be handed to the Club Secretary fourteen (14) days prior to the meeting at which the motion will be put. The common seal must be used only under the authority of the Management Committee. By a second member of the Management Committee. The funds of the Association must be kept in an account in the name of the Association. The financial institution/s in which the accounts are kept are to be determined by the Management Committee. Records and accounts must be kept in the English language and show full and accurate particulars of the financial affair of the Association. A limit of petty cash payout will be set by the Management Committee each year. All amounts over the petty cash payout must be made by cheque or electronic fund transfer. Any one of the other members of the Management Committee. Cheques shall be crossed “not negotiable” except those in payment of wages or petty cash recoupments. The transaction statements have to be verified and signed by two (2) members of the Management Committee, one which has to be the President or the Secretary. All expenditures shall be approved or ratified at a Management Committee meeting. All such statement shall be examined by the Auditor. The auditor shall present his report on the audit to the Secretary prior to the holding of the Annual General Meeting in the following financial year of the year audited. The income and property of the Association must be used and applied solely in promotion of its objects and in the exercise of its powers as set out herein. No portion of the income, assets and property shall be distributed, paid or transferred directly or indirectly by way of dividend, bonus or otherwise by way of profit to or amongst the members of the Association. The payment or repayment to any member of out of pocket expenses, moneys lent, reasonable and proper charges for goods hired or reasonable and proper rent for premises let to the Association. The Management Committee shall provide the safe custody of books, documents, instruments of title and securities of the Association. The financial year of the Association shall close on the 31st December in each year. This rule applies only if the Association is wound-up under part 10 of the Act. No remaining funds, assets or property shall be paid or distributed among the members of the Association. Any remaining property and assets shall be given or transferred to some other institution(s) having objects similar to those of the Association and which equally shall prohibit the distribution of income, assets and property among its members. Such institute or institutions as mentioned in sub-rule (2)(b) are to be determined by the members of the Association.